Steven Spielberg, Tom Hanks, and Alan Alda, all working from a script by the Coen Brothers? Bridge of Spies, you already had our attention. Releasing a great new UK trailer like this doesn’t hurt matters either. A Cold War spy thriller based on real life events, what’s not to love? Take a look after the jump. A dramatic thriller set against the backdrop of a series of historic events, BRIDGE OF SPIES tells the story of James Donovan (Hanks), a Brooklyn lawyer who finds himself thrust into the center of the Cold War when the CIA sends him on the near-impossible task to negotiate the release of a captured American U-2 pilot. Screenwriters Matt Charman and Ethan Coen & Joel Coen have woven this remarkable experience in Donovan’s life into a story inspired by true events that captures the essence of a man who risked everything and vividly brings his personal journey to life. 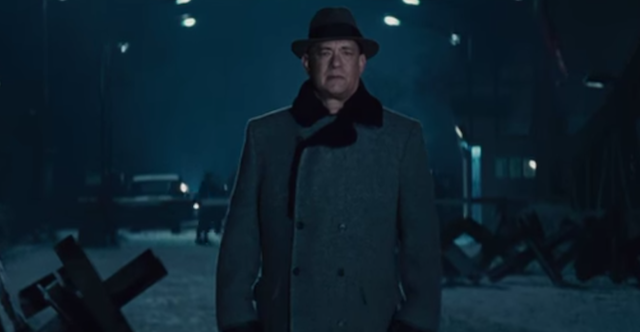 Bridge of Spies opens on October 16. We can’t wait.